Thank-you to all who have trained with me in the past 11 years. I have enjoyed having you and your dogs be a part of A Positive Connection and I hope you have enjoyed the experience as much as I have. I am suspending training classes, as well as private lessons until June of 2019. My husband received a fellowship at Princeton for the academic year, and I am taking this time to work on various writing projects as well as continue to podcast Your Family Dog with Colleen Pelar. Please know that it has been an honor and a privilege to work with so many wonderful owners and dogs. I am grateful for your trust in me and the opportunity to serve you and your canine buddies. 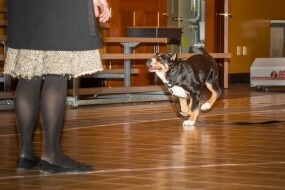 Come Join the Fun, It’s Never Too Late (or early) to Train Your Dog! My goal is to help your dog become the best dog possible through individualized family dog training, behavioral assessments, Canine Good Citizen® training and evaluations, and retail products which enhance your dog’s well being. I am committed to humane, dog friendly service that advances your training goals and helps your dog become a well-behaved member of your family. I’m dedicated to helping you develop a positive connection with your dog that will lead to a lifetime of fun and learning through private and group obedience classes. I want to know what you consider to be a well-mannered dog so I can design a program that will help you achieve your training goals. Please call 740-587-0429. 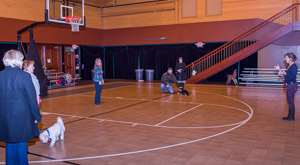 Group obedience (beginning through advanced) classes are offered in six week sessions for $175 and are held at the Bryn Du Fieldhouse. 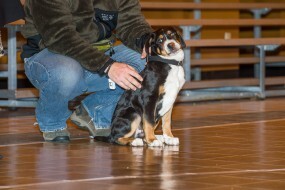 Basic obedience skills such as sit, down, stay, and come are covered as well as door manners, loose lead walking and staying calm and focused around other dogs. Intermediate, advanced and specialty classes take your training to the next level. Please call for more information so we can register you for the class that is best suited to your needs. Please call 740-587-0429. Private lessons are a great supplement to group classes. Private lessons also allow for particular behavior problems or goals (such as earning your Canine Good Citizen® or learning to be a therapy or visiting dog), to be addressed one-on-one and for flexible individualized scheduling. Private lessons start with an initial consult which costs $100.00. In this 1 to 1 1/2 hour session, we meet your dog, assess the problem in detail, create an individualized plan of action, set dates for future training sessions, and choose the training package that best serves your needs. • Individual sessions are 1 to 1.5 hours for $100.00 each. Includes one month of phone and unlimited email support. • Purchase four sessions together for $350.00 and save $50. Includes six months of phone and unlimited email support. • Save $125, purchase six sessions together for $475.00. Includes one year of phone and unlimited email support. • Save $200, purchase eight sessions together for $600.00. Includes one year of phone and unlimited email support.